Carolyn Jean "Cacky" Gardner was born on July 2, 1933, age 85, she passed away peacefully on Thursday, January 17, 2019 at the Lutheran Home & Services, Arlington Heights after a long struggle with Alzheimer's Disease. Cacky was the beloved wife of John Gardner; mother of Rick (Cade) Fields-Gardner, and Nancy (Bruce) Bermann; and grandmother of Karl, Hans and Max Bermann. Cacky worked as am elementary school teacher as well as a junior high math teacher in Arlington Heights. 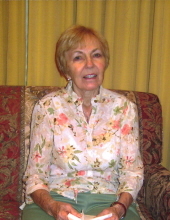 She adored tennis, golf, and bridge, and shared those interests with her husband. Her sense of humor brightened the lives of all she touched. She instilled her musical and sports interests upon her son, daughter, and grandchildren. Her family will receive guests from 9:00 an until 12:00 pm, Saturday, January 26, 2019 at the Glueckert Funeral Home Ltd., 1520 N. Arlington Height Road, Arlington Heights, Illinois. The Gardner Family thanks the staff at Lutheran Home and Services for their loving care. Cacky, Mom or Nana, we will always love and hold you close in our hearts. In lieu of flowers memorials may be given to: Alzheimer’s Association of Greater Chicago, 8430 W. Bryn Mawr Suite 800, Chicago, IL, 60631 www.alz.org/illinois. "Email Address" would like to share the life celebration of Carolyn Jean Gardner. Click on the "link" to go to share a favorite memory or leave a condolence message for the family.